Last Friday (5/9) at Menlo School’s 5th annual Maker Faire, teenage makers demonstrated the science inventions and innovative projects they’d worked on this year in classes such as Engineering, Robotics and Applied Science Research, including a singing Tesla coil, robots that wrestle, a self-parking car, and a solar-powered bike. In each of these courses, students learn the usual science skills and topics — and then use them by applying them to real projects. For example, Applied Science Research students learn about the ideal gas law, and then use it to calculate atmospheric pressure and magnetic fields as they build and launch a weather balloon carrying sensors, analyzing the data they’ve collected. Menlo is a MENTOR Makerspace pilot school, and many of these projects were built in Menlo’s Whitaker Lab, the school’s own maker space. The Lab — full of movable work spaces, electronic parts, an equipment room with a table saw and laser cutter, 3D printers and a conference room for brainstorming — provides students with opportunities to learn creative problem solving, collaboration and design thinking — skills they’ll need as they move into college and the work force. 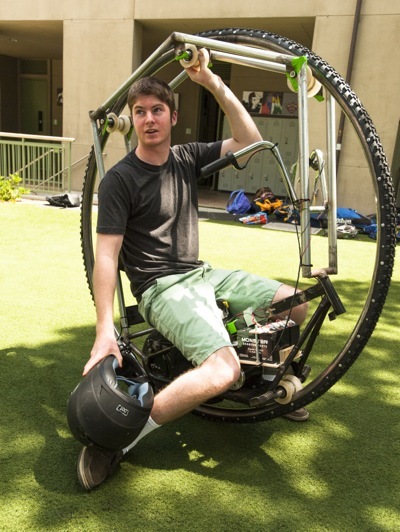 For the seventh year in a row, the student makers will show off their projects at the Bay Area Maker Faire on Saturday, May 17 and Sunday, May 18 at the San Mateo Event Center.